Robot is a adventure-game, where you lead your controled body through different very exiting rooms up to the bad king. For your way, you need the right keys for the dors, you need to destroy your enemies (the robots) and you have to solve some problems. The idea based on the very old, famous, same-named DOS-game Robot. The gameplay is the same, but the original game is much more complex, the graphics are better and the world is bigger. 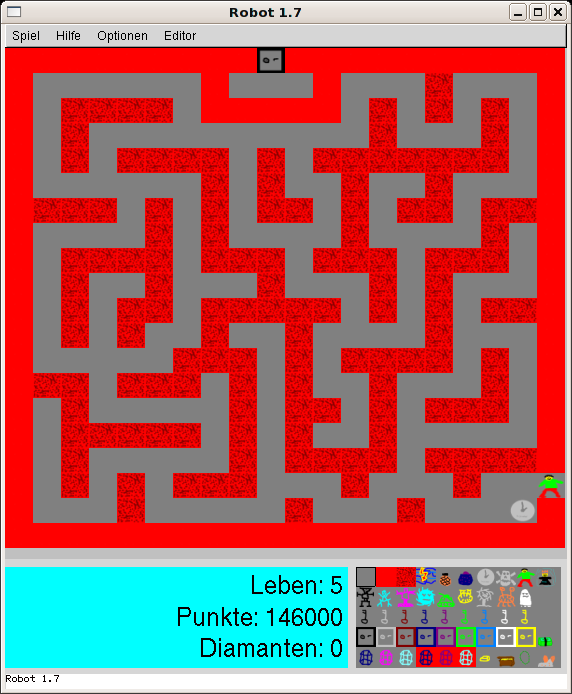 The project Robot 2 is a port of my old Visual Basic project Robot 1, one of my very first games. Robot 2 was coded in Object Pascal for Free Pascal with Lazarus. You can desribe Lazarus as a plattform-independend, open-source and free alternative to Delphi. Take a look at it, it is very nice. The beta version (all version less than 2.0) was coded for beginning programmers. I wanted to show how you can code a complex game like this with very basic programming technics. After a little tutorial in Delphi or Lazarus, everyone should be able to read and understand the whole source code. See also my coding for absolute dummies tutorial (german only at the moment) for more information. Version 1.7 now contains a complete new world with new mysteries and an ingame-leveleditor. All beta versions after 1.7 contains an ingame-leveleditor. Go into the editor mode (menu). All game-objects are listed in your knapsack. Simply select an object and place it in the present room by left-clicking at the wanted position. You can also select the objects in the knapsack by clicking on them. With a right-click, you can remove an object. With Ctrl+Arrowkey, you can switch to other rooms. Don't forget to come back to the room where your body is, because else, you can't resume playing on exiting the editor mode. You can change any event of some game-object or everything else by simply change the dependent source code. You don't need any programming experience, it is very easy. Open the Lazarus project-file (robot.lpi) with Lazarus (download it here) and look at the code of umainform.pas. Perhaps the most interesting functions for you are MoveToPlace and UseKnapsackSelection. If you make any change and think it will be interesting for others, simply mail me. All archives include a precompiled Linux x86 bin, a Windows EXE and the complete source code with the Lazarus project-file. If you understand german, my tutorial coding for absolute dummies may be interesting for you. After some basic programing technics, it uses this game as a main sample. You are the 1502498th visitor, who looks closely at this site.